The Young Farmers panto is unlike any other! The very few "proper professional" pantos I have been to in the past I hated and funnily enough so did the boys. I can't bear the innuendo and girly nature of them. 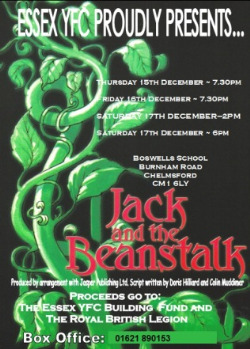 Thankfully a few years ago the young farmers put on a panto to raise funds and it was such a resounding success that they continue to do them every year. The boys love it. We went last night with Granny and my sister & brother-in-law Christy and Charlie and had the most fantastic time. Archie has worked out that if you go up on stage you get sweets for suffering a few moments of public humiliation and heh it works. It made us all feel very Christmassy so I think later today we should definitely go to The Christmas Tree Farm to get a tree before they sell out. We go to a similar affair run by the amdram society in the next village. Lots of in-jokes and it seems to go on for hours as audience and performers get more and more tiddly. Unmissable!